Review: A corporation literally calls the shots when they hire a professional assassin (John Cusack) to take out a Middle Eastern politician. That's the easy part. The more difficult end is Cusack's cover which has our perplexed protagonist posing as a trade show representative who must also organize the wedding of a Middle Eastern pop star (Hilary Duff). How's that for an original movie premise? War, Inc. has very high aspirations for this not-at-all subtle satire of the state of affairs of business, war, politics, greed, pop culture, advertising, and the media. It's very entertaining on an almost cartoonish level thanks to its silly, over-the-top tone and performances, but it doesn't ever really come together as a whole. It might have worked better as a movie filled with random sketches concerning the same ideas and premises. However, it does have its moments, especially with John Cusack's deadpan line deliveries, the sight gags, and the unexpected action scenes. Hilary Duff was surprising here as a pop star that's more than just a pretty face. And Marisa Tomei is very game for both the humor, her character's solid principles and politics, and the flirtatious banter with Cusack. 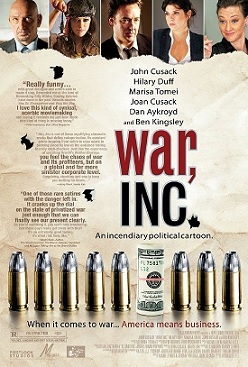 War, Inc. is very entertaining, but misses the mark at times; pun intended. A good time for those die hard fans of John Cusack. Fun Fact: The cast considered this movie to an unofficial sequel to Grosse Pointe Blank (1997).